CalCAN’s bill, AB 2377, passed unanimously on the Assembly floor this week on a 72-0 vote. The bill now heads to the state Senate. 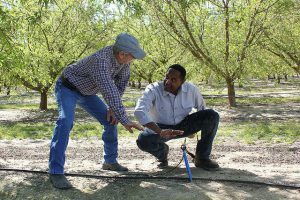 AB 2377 aims to improve farmer participation and impact of Climate Smart Agriculture programs by providing technical assistance for farmers and ranchers seeking to do projects under the programs. CalCAN developed the bill with Assemblymember Jacqui Irwin, D-Thousand Oaks, and our partners after hearing loud and clear from farmers that the Climate Smart Agriculture programs require considerable project development and implementation work and the applications are complex and time consuming. But unlike the federal farm bill conservation programs, the state offers very little technical assistance for farmers who want participate in the Climate Smart Agriculture programs. AB 2377 aims to fix that. The bill is supported by over 20 agriculture and conservation groups. The bill requires that 15 percent of the annual budgets for three Climate Smart Agriculture Programs—State Water Efficiency and Enhancement Program (SWEEP), Alternative Manure Management Program (AMMP), and Healthy Soils Program—are used to establish a technical assistance grant program. Resource Conservation Districts, Cooperative Extension and nonprofits can apply to technical assistance fund. They can receive up to $125,000 annually for up to three years to support farmer applicants to the programs with outreach, project design, application assistance, and project implementation. Importantly, AB 2377 prioritizes technical assistance for small and moderately-scaled farms and ranches and requires at least 25 percent of the technical assistance funds available to be provided to socially disadvantaged farmers and ranchers, as defined by the Farmer Equity Act that passed last year. We will keep you update on the bill’s progress and opportunities to voice your support. If you have any questions or comments about the bill, please email us at info@calclimateag.org. This year, CalCAN and our partners have been advocating to restore funding to Healthy Soils Program and the State Water Efficiency and Enhancement Program (SWEEP). Funding for both programs was eliminated for the current fiscal year. More on that here. To our disappointment, the funding for fiscal year 2018-19 proposed by the Governor, the Assembly and Senate for Healthy Soils and SWEEP fall well below what is needed for the programs. See the table below. CalCAN is also advocating to decouple the budget for the Alternative Manure Management Program (AMMP) from the other dairy methane program that funds anaerobic digesters. To date, AMMP’s funding level has been determined by CDFA which appears to base its AMMP funding decisions not on demands for the program, but on demands for dairy digester funding. We want to see an end to this competition in funding for the two program and instead have specific allocation of funding for AMMP, based on the program’s needs. Another important part of this year’s budget debate is the prospect of additional funding for natural and working lands programs from Proposition 68, a bond measure that will go before the voters in June. This one-time funding could provide an important boost, but not a long-term funding fix for our key programs. The Assembly and Senate budget conference committees began meeting this week. Different than in recent history, it seems likely the June budget will include final funding levels for the climate change investment programs, including the Climate Smart Agriculture Programs. Stay tuned for our updates in the coming weeks. In the meantime, please call your Assemblymember and Senator to urge their support for CalCAN’s budget asks. Click here for our recent call to action! *GGRF is the Greenhouse Gas Reduction Fund, the cap-and-trade funding that supports California’s Climate Change Investment programs.